A new study from the U.S. Department of Education says the vast majority of teachers spend their own money on school supplies. That’s likely no surprise to North Carolina teachers. 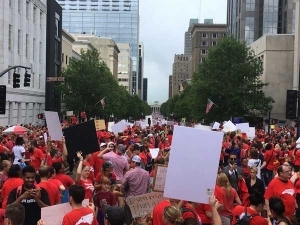 Many of the 20,000 or so who marched on Raleigh this week spoke openly and often about spending hundreds out of their pockets on school supplies, a reflection of insufficient school funding. “I didn’t know what I was getting into,” one first-year teacher, Sari Diaz of Onslow County, told Policy Watch Wednesday. A report from The Independent breaks down just how common it is for teachers like Diaz to run into this problem in American schools. Andy Yung, a nursery teacher in Queens, New York City, is adept at raising money online for ambitious classroom projects, but even he sometimes pays for supplies out of pocket. And he has company. It made little difference whether they taught in cities, suburbs or rural areas, or whether or not their students were poor — virtually every public school teacher said they had used their own money for their classrooms. On average, public school teachers earned just under $60,000 last school year, according to the National Education Association, but pay is so low in some areas that officials have been recruiting overseas. Limited budgets and red tape have led some teachers to seek outside funds for classroom projects. Like Mr. Yung, some of them use DonorsChoose.org, a crowdfunding website where educators can solicit donations for supplies, trips, and other projects.